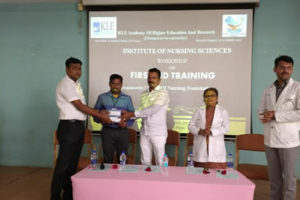 Department of Nursing Foundations, KLE University’s Institute of Nursing Sciences, Belagavi organized a one day workshop on “First Aid Training” on 3rd November 2018 at Seminar Hall, KAHER Institute of Nursing Sciences Belagavi. The workshop considered & highlighted the goal of the First Aid training for HESCOM employees. There were totally 40 number of participants for the workshop. The workshop started at 9am with the inauguration. The welcome speech was delivered by Organizing Chairperson, Mr. Ashok Kamat,Asso Prof & HOD Department of Nursing Foundations. Mr.Nataji P Patil. Vice president HESCOM, Belagavi,Who was instrumental for the occasion, He spoke & emphasized on importance on First Aid training for HESCOM employees. In the post lunch session the demonstration of the first aid procedures in Nursing Foundation lab by all resource persons. 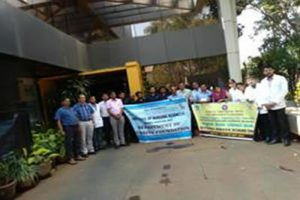 Followed by group activities by the participants, which was managed by department staffs. All the expert lectures were well appreciated by all the participants which were beneficial for them in the knowledge & practice aspects in the field. The workshop sessions ended at 4.00pm. The valedictory function is held at 4.30pm Prof. (Dr.) SudhaRaddi, Principal, KLE University’s Institute of Nursing Sciences, Belgaum, who was instrumental for the function, unable to attend the valedictory function because of busy schedule,she conveyed her wishes & congratulated the organizers & participants for the successful workshop. THE first aid box are donated to the HESCOM employees by the vice Principal Mrs. Sumitra L A. & HOD Mr Ashok K.
The Participants applauded and gave their views on workshop through the evaluation sheet; on the basis of evaluation 96% of participants appreciated the workshop. Mr. Ashok K.Asso Prof & HOD dept of nursing foundations,Mr.Manjunath S. Asst Prof, Mr. Laxmikant B., MrsLaxmi K., Miss. Shridevi T., Miss. Rajashree K. senior tutor, Department of Nursing Foundations,were present on the occasion. 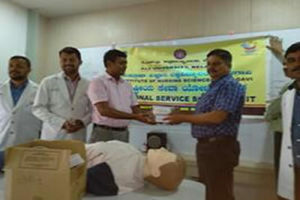 The Department of Nursing Foundation, KAHER Institute of Nursing Sciences Belagavi, organized a Guest Lecture on “Basic Life Support” for students of 1st yr B.Sc. (N) on 20-02- 2019. The Expert Lecture was delivered by Dr. Vinayak Jannu. Assistant Professor, department of Anesthesiology, KAHER J.N.Medical College, Belagavi. After the lecture the forum was open for queries to clear their doubts. 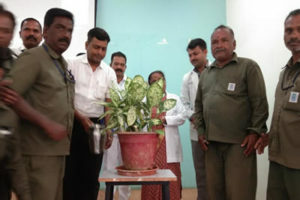 Total 100 Nursing Students were benefited by the guest lecture. All the Staffs of Department of Nursing Foundation, B. Sc (N) 1st Year students were benefited by program. 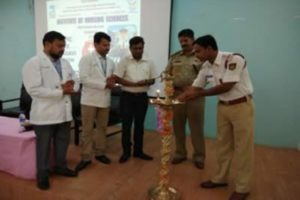 The Department of Nursing Foundation, KAHER Institute of Nursing Sciences Belagavi, organized a Guest Lecture on “Basic Life Support” for students of 1st yr B.Sc. (N) & GNM, on 16-03-2018. The Expert Lecture was delivered by Dr. Vinayak Jannu. Assistant Professor, department of Anesthesiology, KAHER J.N.Medical College, Belagavi. After the lecture the forum was open for queries to clear their doubts. 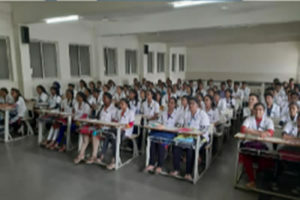 Total 159 Nursing Students were benefited by the guest lecture. 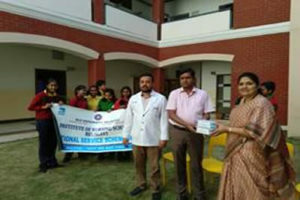 All the Staffs of Department of Nursing Foundation, B. Sc (N) 1st Year, and 1st year GNM students were benefited by program. 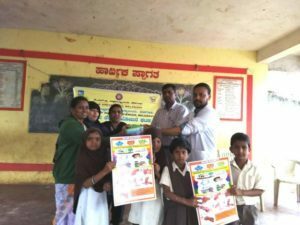 NSS unit of KLEU’s Institute of Nursing Sciences along with Department of Nursing Foundation had organized role play on prevention of Cholera ,Hand Hygiene awareness programme for primary school children, Training on First Aid for teachers and Distribution of First Aid box for Government primary school at Badas and Gajpati Belagavi on 17th February 2018. 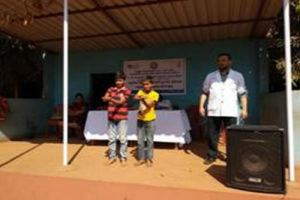 First Aid treatment for minor injuries was delivered to school teachers by Mr. Ashok Kamat, HOD Nursing Foundation, and hand washing technique was demonstrated to primary school children by Mr. Vikrant Nesari Asst. Prof, Department of Nursing Foundation, First Aid for fracture, wound dressing was demonstrated to school teachers by Mr.Manjunath Sogalad Asst.Prof. 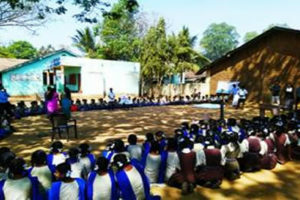 Department of Nursing Foundation, and first aid box and hand washing technique and posters distributed to primary and High schools at Badas & Gajpati village, followed by Role play on prevention of Cholera by 1st B.Sc. (N) students Ms.Sridevi T., Mr.Laxmikanth B. and head masters of Government primary schools Badas & Gajpati were present on the occasion. The forum was open for queries to clear their doubts. The teachers and students were also actively involved in the programme, around 14 teachers and 550 students are benefited. 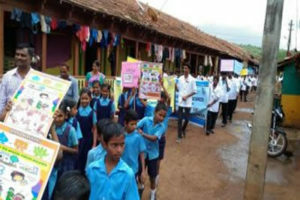 NSS unit of KLE Institute of Nursing Sciences Belagavi with Department of Nursing Foundation had organized a Health Education programme on Hand Hygiene awareness programme for primary school children and Training on First Aid for teachers of Government primary school at Marihal and Sulebhavi, Belagavi on 11-02-2018. 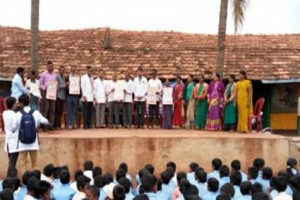 Lecture on First Aid management for minor injuries was delivered to school teachers by Mr. Ashok Kamat, HOD, hand hygiene techniques were demonstrated to primary school children by Mr. Vikrant Nesari Assistant professor, first aid box and hand hygiene posters distributed to Government Kannada and Urdu medium primary schools at Marihal and Sulebhavi, Belagavi. Mr.Laxmikanth B. senior Tutor and head masters of Government primary schools were present on the occasion. The forum was open for queries to clear their doubts. The teachers and students were also actively involved in the programme, around 19 teachers and 450 students are benefited. The Department of Nursing Foundations, KLE Institute of Nursing Sciences, Belagavi. Had conducted a First Aid Training programme for students of KLE International School Belagavi on 03/02/2018. Mrs.Deepti Ingale Principal KLES International School welcome the guest. Mr.Ashok Kamat.HOD spoke about importance of First Aid & demonstrated First Aid Box, Mr.Manjunath Sogalad. 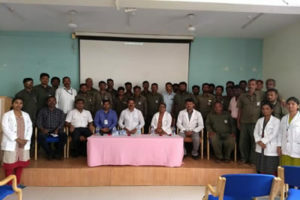 Assistant Professor discussed First Aid management for Drowning, animal bite. Mr. Vikrant Nesari. Assistant Professor explained about First Aid for Bleeding, Wound dressing & bandaging. 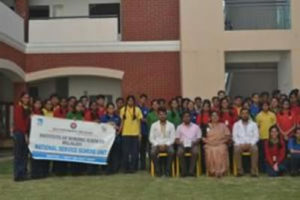 Around 135 students were benefited by the programme. 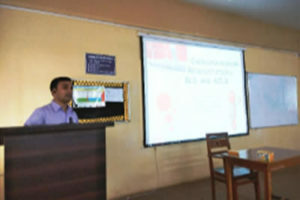 Mr.Ashok Kamat.HOD spoke about importance of First Aid & demonstrated First Aid Box, Mr.Manjunath Sogalad.Assistant Professor discussed about Cardio pulmonary resuscitation (CPR), Mr. Vikrant Nesari. Assistant Professor explained about First Aid for Unconscious victims & Fracture. Ms.Shridevi Teli. & Mr.Laximikanth Bhangennavar Senior Tutors dealt about Wound dressing & bandaging. Santosh Mamdapur & Vinayak Lokur CEO Expert Engineering Enterprises, Around 35 employees were benefited by the programme. The NSS unit of KLE VK Institute of Dental sciences Belagavi along with Department of Nursing Foundations, KLE Institute of Nursing Sciences, Belagavi. 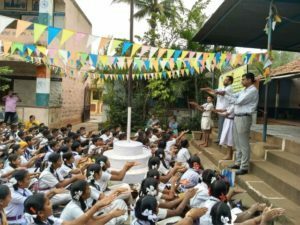 Had conducted a Hand Hygiene awareness programme for Government High & Primary School Children Shindoli, Belagavi on 20/01/2018. Mr. Vikrant Nesari. 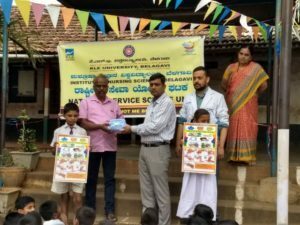 & Mr.Manjunath Sogalad Assistant Professors demonstrated Hand washing techniques and distributed hand washing posters school. School Headmaster & faculty were present during the programme. 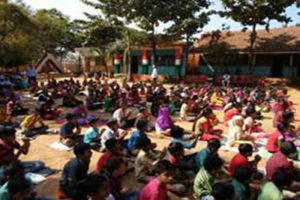 Around 110 children were benefited by the programme. 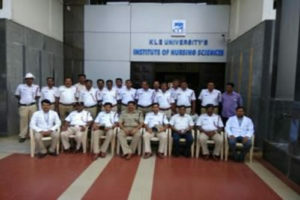 Department of Nursing Foundations, KLE Academy Of Higher Education and Research’s Institute of Nursing Sciences, Belagavi organized a one day workshop on “First Aid training programme for Traffic police of Belagavi Division” on 19th May 2017.The workshop considered & highlighted the goal of the First Aid training for Traffic police. There were totally 43 number of participants for the workshop. Organized by Department of Nursing Foundation from 22nd to 27th September 2016.